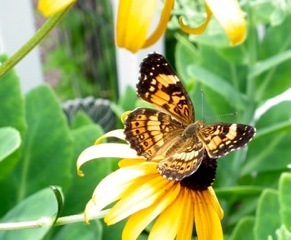 Butterflies - The Silvery Checkerspot Butterfly visited our deck one day enjoying the Black-eyed Susans which is one of their larval food plants for the caterpillars, so I imagine it was laying eggs as it fluttered around the flowers because it has no nectar for them. A few weeks later I noticed some chewed up leaves but no caterpillars. They had already grown up and gone to turn into butterflies. 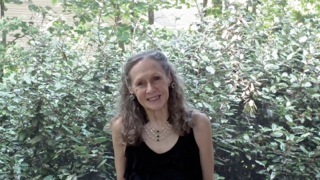 Tidbit - Birds - Have you seen some videos where people smear Vaseline or some kind of grease on the pole when they have problem with squirrels and raccoons raiding their feeders? They work and they're funny, but definitely NOT good for the birds. If it gets on a bird’s feathers they cannot preen it out, and when feathers cannot be preened, they don’t work well for flight or insulation. That leaves the bird vulnerable to predators, bad weather, and disease. Birds - We have an American Crow (2015 photo of crow) drinking from the deck birdbath, which is only 20' from our backyard pond where they usually drink. I think this one is one of this year's babes that has a personality of its own and wants to be different. They're usually not that fond of being close to humans, but this one seems to "know" me. The American Goldfinches are gone. When we lived in Alabama, we only had these birds during the Winter. They would leave as the males were getting their beautiful yellow coloring. The Catbirds left awhile back. Sure is hard not to think that Winter is on its way here. Our Ruby-throated Hummingbirds have flown away to begin their trip south to the Gulf Coast and an amazing journey across the Gulf of Mexico to Central and South America. Some of them overwinter in Mexico and sometimes on the Southern Coast of the U.S. Watching their tiny wings at our feeders just boggles my mind with how they do this ... and they do it all alone ... measuring only 3" from tip of beak to tip of tail, with the beak being 1/5 of its length. They don't fly in flocks as many migrating birds do. What amazes me most is how does the young that have been born here find their way to "their" migration point? About a month ago I changed the recipe for the feeders to be 1 part sugar to 3 parts water. Normally it's 1:4, but when they are tanking up for the migration, the 1:3 is closest to what nature's nectar is. I have kept my feeders out since there will be others flying through and some that left later than they should, so to spot a red feeder will be a blessing to some on their journey, especially if frost has hit and took out their normal nectar source. 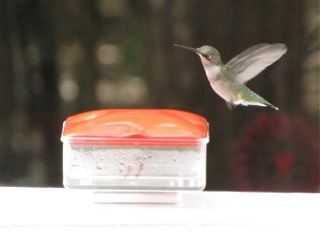 It's a fact that more hummingbirds die of starvation during migration than any other cause of death. Tidbit - Tree Church - For some people, the worship of nature and the divine go hand in hand. They see the overwhelming beauty in the world around them and can't help but see the hand of God at work. The immense diversity itself is testament to Him. Brian Cox, a New Zealand native, spent years traveling the world and studying many different houses of worship. He's also the owner of Tree Locations, a company that moves and plants large trees. So when he returned home, he knew exactly what he wanted to do to build his own monument to spirituality and that was to build a Tree Church. Thanks to my friend, Carolyn, for sending it to me. Check it out! Trees & Spiritual - In the Costa Rica rain forests, you may commonly see extremely old trees that seem to have been consumed by a vine which is known as the Strangler Fig Parasite. This parasite comes when an infected bird poops on top of the tree. 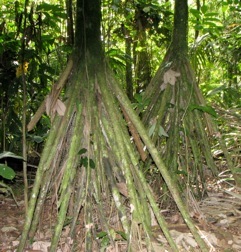 The parasite then forms vines that grow down the tree to the root system. Once at the tree’s roots, the parasite takes over and slowly kills the tree, but the vines are left in it’s place. The vines of the parasite become very large and very strong, almost tree like. This tree already has a termite nest in it to help the process along (notice the black area center right). View Photo. Another unusual tree is the Walking Palm (Socratea exorrhiza), also known as the "stilt palm," has a unique ability among trees; it can actually move itself from one place to another. It's a palm that is native to rain forests of tropical Central and South America. Its common names come from the fact that the tree's stilt roots enable it to slowly shift position, up to more than 3 feet (1 meter) a year, when it desires to change it's location. This tree made me think a lot about life while I was in La Selva's jungle, so at the time I wrote an article, Uproot Yourself and Move On, that included a lot of information on this tree and how we can apply another created by God example to our lives. Family - This is one of my favorite photos. Don't you have some photos that just jump out at you when you think of them. That moment in time that was so special. A photo can bring back many memories and smiles and give you a clearer visual than our mind may have of that time past. My son says he remembers most of his life through my photos. That's cool. Many times because I am so busy being "Kathy Kodak" I miss some things going on, but the photo always allows me to get the broader picture and probably even see more than what was going on at the time. This photo was from his visit for my 60th birthday in September 2010. He flew into Richmond, VA, so when I picked him up I had plans for us to do the art museum since we both love art museums. It was an awesome museum with all kinds of artistic presentations. We were both thrilled with it. 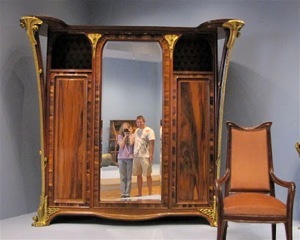 You can view our visit in my photo gallery: Virginia Fine Museum of Art. Tidbits - Cats, Rodents & Disneyland - It’s impossible to pinpoint exactly when the first cats started to appear on Disneyland property, but there have been sightings going as far back as 1955. Soon after Disneyland opened, Walt decided that there should be an attraction, Sleeping Beauty Castle, and so brought imagineers into the castle to begin the planning process for what would eventually become the Castle Walkthrough. He was greeted by quite the sight—scores of feral cats had set up a home for themselves inside the building. Not only that, but the cats had brought with them an infestation of fleas. It became clear that something needed to be done about the cats, but the Disney company knew they couldn’t exactly “eliminate” the problem. The immediate solution was to adopt out the cats to cast members. They dealt with the flea problem as quickly as possible too. Meanwhile, being an outdoor theme park with lands meant to simulate rustic situations, Disneyland had developed a bit of a rodent problem. While the irony was lost on no one in the company, Disneyland had mice running around—and we’re not talking about Mickey and Minnie. There were also still plenty of feral cats on property who hadn’t set up shop in the castle. The cats were smart and realized they’d found a decent hunting ground on a property that was free of all the typical dangers stray cats have to face. They were able to emerge at night to a relatively empty park to hunt in peace. Someone in the Disney company had a pretty brilliant idea. The cats weren’t bothering anyone—feral cats, by nature, are scared of humans—and they were doing a much better job with pest control than any human exterminators were likely to do. So the cats were put to work. More accurately, they were allowed to continue doing the work they were already doing. Read the whole story. Critters - This little guy sucked his last drop of nectar and died on our deck. It's a Giant Hornet, aka as European Hornet that was introduced to NY in the mid-1800s. Well established in the northeast, they are expanding their range to the northwest and south. At up to an inch long (18-25 mm) they are much larger than yellowjackets. 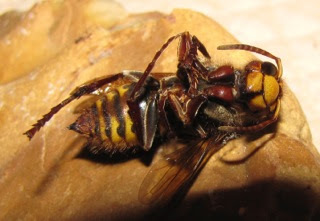 It is actually the only true hornet found in North America. I think it has a sweet little smiling face. They are usually regarded as pests by those humans who come into contact with them. 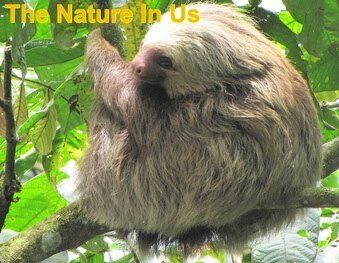 Average nests hold 200-400 workers and are built in hollow trees and other cavities. The nests are made out of surrounding plant materials and other fibers to create intricate paper nests. We had a beautiful nest in the eaves above the guest room window one year. Workers are active day and night and may be attracted to lights at night. Adults prey on a variety of insects, primarily wasps, large moths, and other large bees sometimes raiding beehives to rob honey and drink nectar. Larva feeds on insects pre-chewed by adults. It defends its nest from intruders but otherwise avoids confrontations when possible. We are blessed with a lot of bees. Many of our friends with gardens have a greatly reduced abundance of vegetables because of the declining numbers of pollinators. I am fascinated by the sheer number of the types of bees and wasps that we've seen here. Some of them I have identified and others it's just too difficult to be sure. This Common Eastern Bumble Bee is a pollinator of flowers and numerous fruit and vegetable crops, including tomatoes, blueberries and cucumbers. These days with pollinators being in such demand, I don't think anybody would call them common any more. 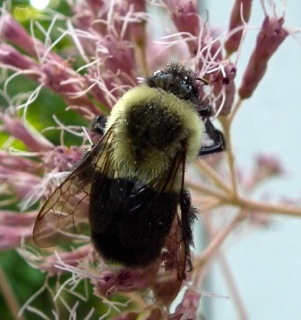 They are a bit smaller than the Carpenter Bees we have and although Carpenter Bees are sleek and shiny without hair on their backs, Bumble Bees have fur all over their bodies. These hairs collect and trap pollen which the bees carry from one bloom to another. Not Into Buzzing Bugs? What critter breathes with its feet, has thousands of jaws but no mouth, has up to fifty arms, and an eye on the end of each arm? No, it's not a new creature for the next Star Wars movie. It's the starfish. When God designed the starfish, it almost seems as if He tried to see how differently He could make this creature from all the others. Depending upon the species, the starfish can have from three to fifty arms while there is an eye on the end of each one. The rough skin of the starfish is covered with tiny jaws to keep parasites from attaching themselves to the starfish. Even more amazing is the fact that each of these thousands of jaws works independently of the rest. 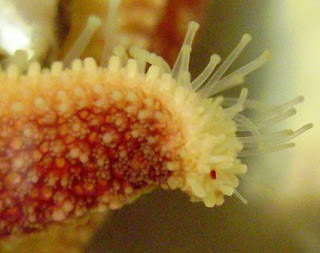 To get its oxygen, the starfish takes water in through tubes in its feet, each containing a tiny pump and a pipe system linking it to the other feet. Tidbit - Wendy's Humane Animal Treatment - We've been vegetarians for 36 years and the reason we switched was based on the horrible treatment food animals were put through to produce our food ... which of course affects the hormones they're producing in their lifetime besides the ones injected to fatten them up quicker and the antibiotics to cover over the crowded unhealthy conditions of the animals ... all of which affects our health by consuming them. That has also kept us out of fast-food restaurants over the years, although eating out has never been a fun thing to do for me and fast-food places have never had rave reviews for being a nutritional place to eat. That's been changing in recent years with places like Chipotle, Panera and many others getting into the local and healthy food bandwagon. I came upon a headline of Wendy's being concerned about humane animal treatment, so I had to follow it hoping things are getting better out there. It is encouraging to know they are. Others will also follow. Here's a bit of the news: "One of Wendy’s chicken suppliers, O.K. Foods in Ft. Smith, Arkansas, has installed an innovative system that significantly improves the welfare of chickens. Called LAPS (low atmospheric pressure system), it produces permanent unconsciousness in the bird before any handling by plant workers. It also replaces the industry standard practice of electrical stunning of chickens. Wendy’s is the first quick-service restaurant chain to embrace the LAPS system, and we encourage all chicken producers to embrace this practice." Read more about their other practices. Spiritual - God has a plan for your life. I've been thinking a lot lately about how I have not received all that He has for me over these years I've been on the planet. I was a strong-willed child and very independent being raised as an only child. Things seem to pretty much go my way as I was growing up and I carried that over into my adult life and into my spiritual life after accepting Jesus as my Savior. I realized that I certainly had not accepted Jesus as my Lord ... meaning that I would follow Him. That I would "lean not to my own understanding, but would acknowledge (submit to) Him in all things, so He could direct my paths" (Prov. 3:5-6). Do you ever wonder why you have so many "issues" to deal with in life? Shouldn't it be a lot simpler than this? Notice how some folks glide on through barely being touched with trials and bad circumstances? I can definitely see that I brought on most of my griefs and sorrows by my own leading. Instead of following Jesus, I basically set my course and assumed He'd follow me. Well, it's never too late for Jesus. The spiritual dimension has no time. There is no time in Heaven. I always thought it interesting that astronomers could hear music in space ... old music. It's like the galaxies absorb every sound of our planet. That's quite a humbling thought when I consider some of the things I've said ... some of the things I've spoken over my child as a mother ... some of the things I've spoken to my husband as a "contentious wife" (Prov. 25:24). But life isn't over until it's over, so there's always time to repent and change. The word "repent" (metanoēte in Greek) actually means "to change your mind." All we are asked to do is to change our mind to the will of God. I thought I had to grovel at the Lord's feet begging forgiveness for every sin I could think of. Now I consider that Jesus bore ALL of my sin -- past, present and future. Nothing is a surprise to Him and "nothing can separate me from the love of God in Christ" (Romans 8:38-39). Have You Made Him Lord? He Knows What We Need, Trust Him! We are His sheep .... baa! change your mind to His will for you.